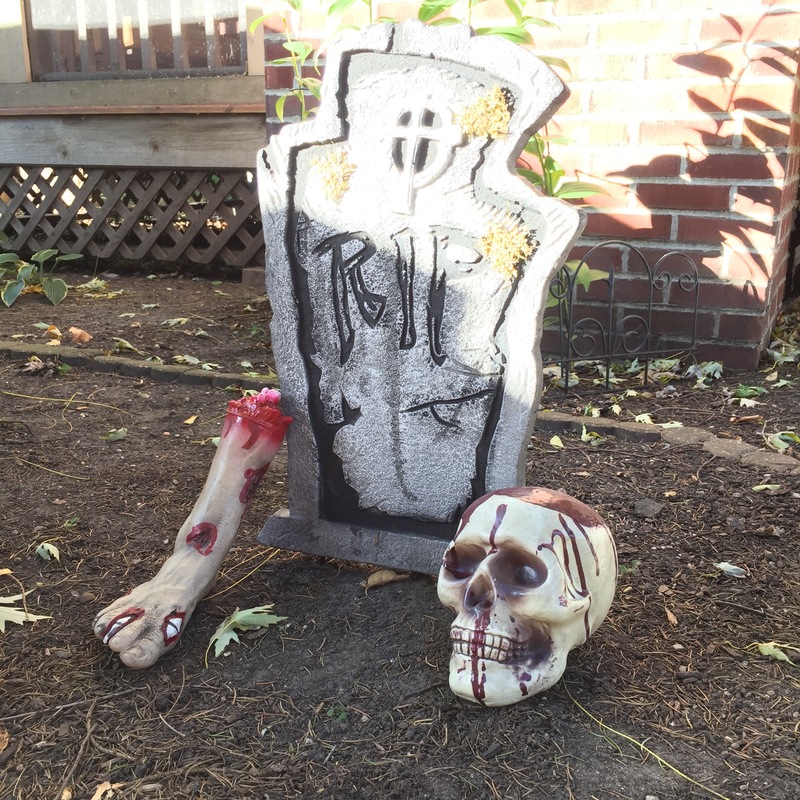 Halloween isn’t celebrated in the Netherlands like it’s celebrated here in the U.S., so I’m very excited that Noëmi got to experience it here, or, if not the actual holiday, at least the preparation. 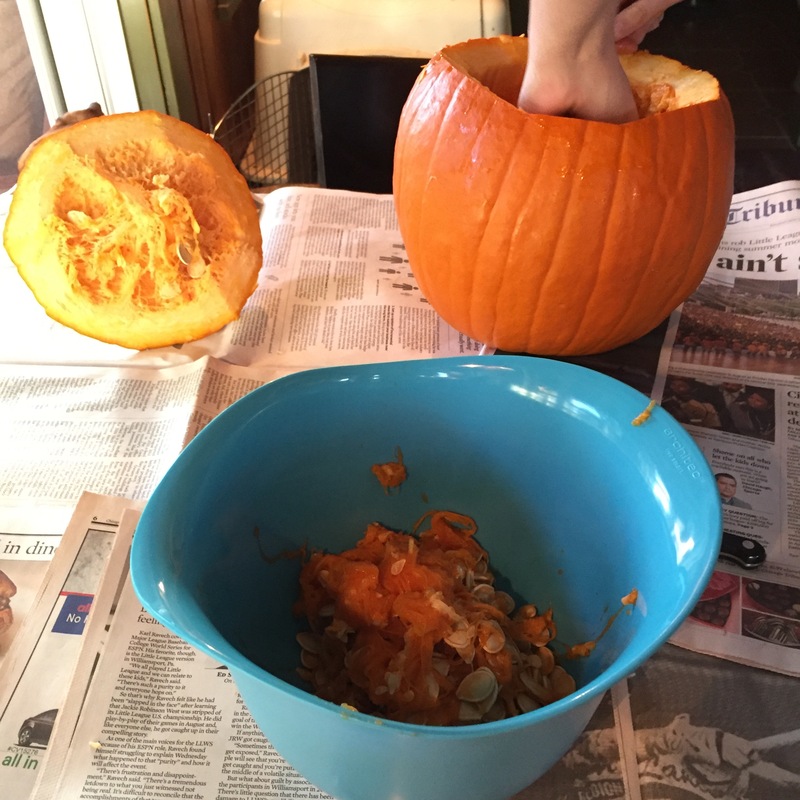 The first thing we did was get a couple of pumpkins for carving. 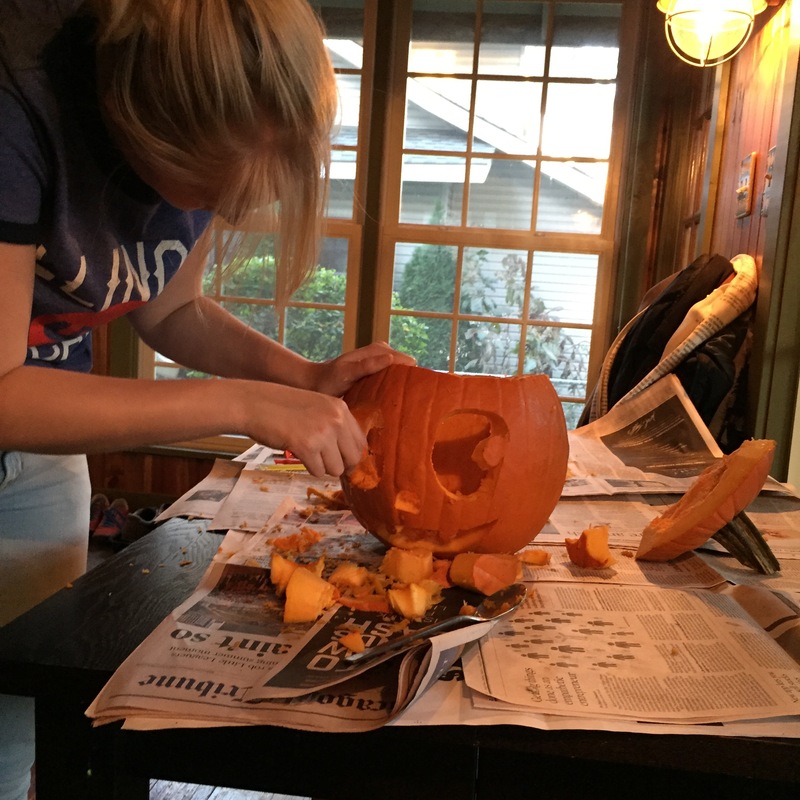 Noëmi had never carved a pumpkin before, so she was very excited. 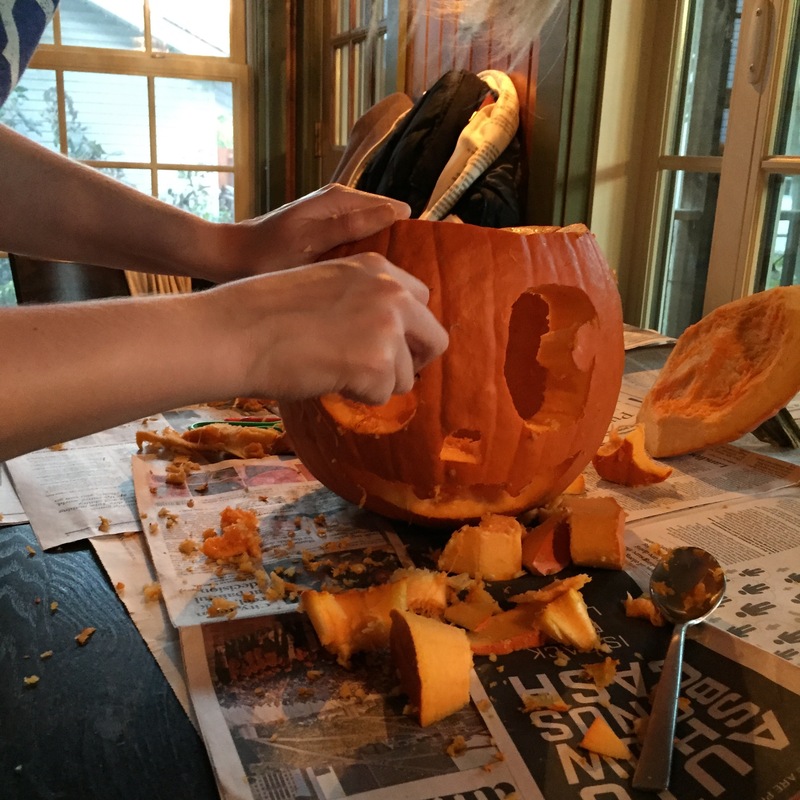 We googled “Jack-o-Lanterns” for some good ideas, and then we set to carving. 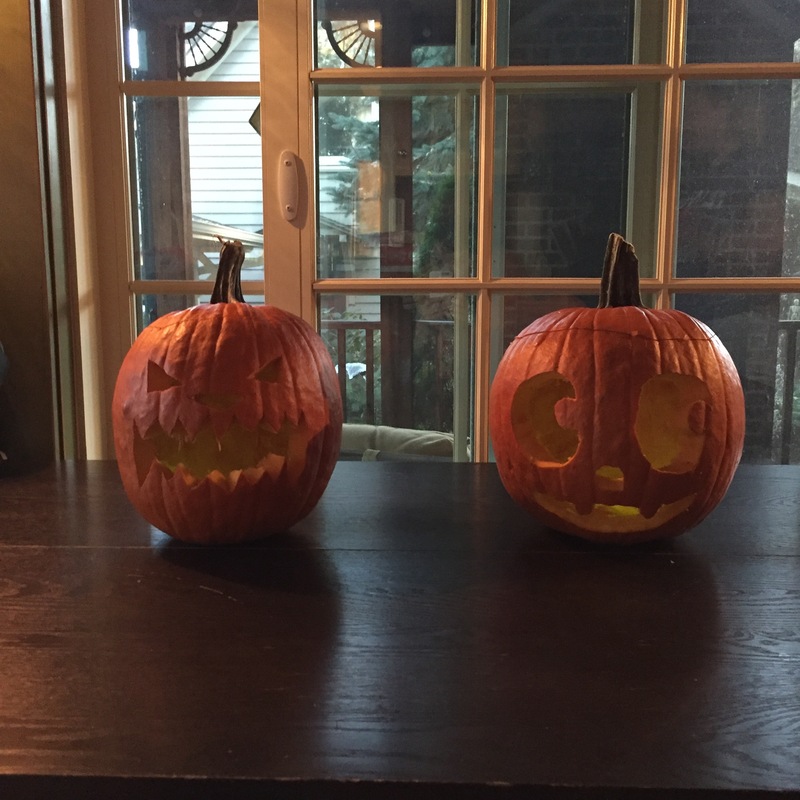 Noëmi decided that her pumpkin would be smiley and cute, while I decided mine would be scarier, toothier. They both turned out pretty darn good. 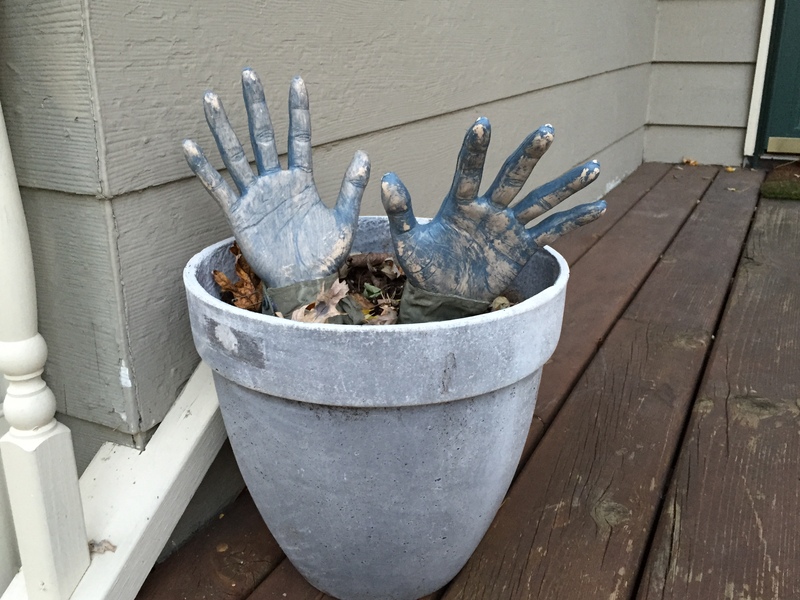 Once we had some ghoulish gourds, we set out to spookify the house. 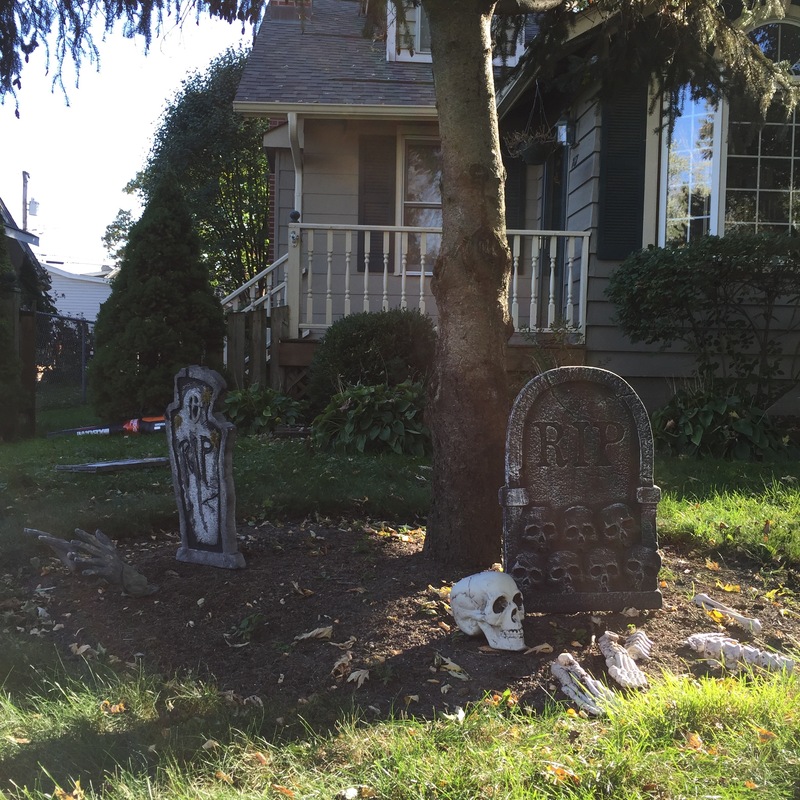 I took out my bag(s) of bones, my gravestones, ghosts, and my zombie gnomes, and we went at it. 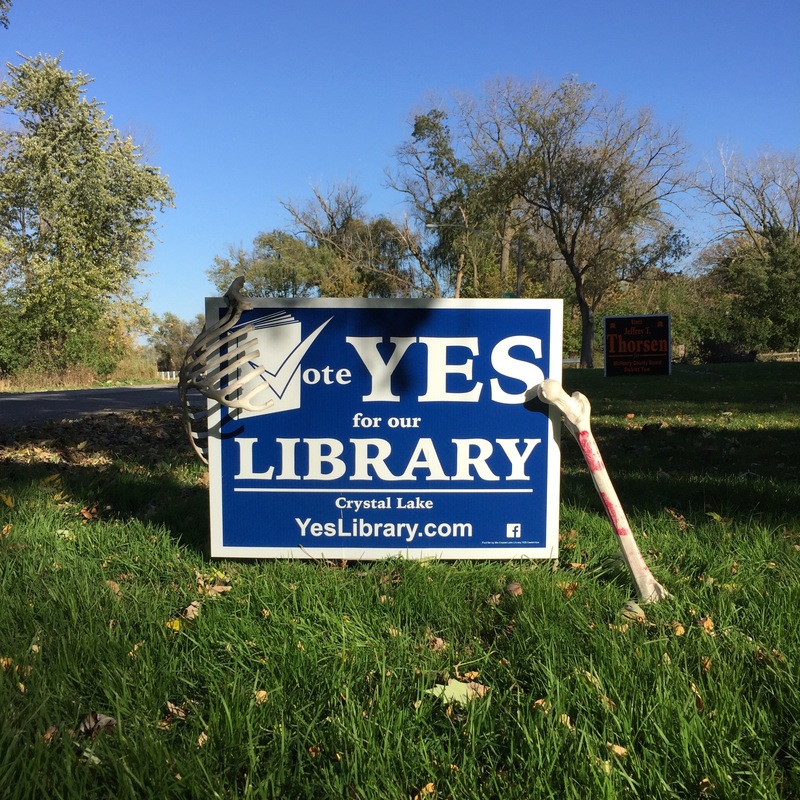 We’re voting “Yes” on November 8 for a new library; and so is our ribcage and femur. 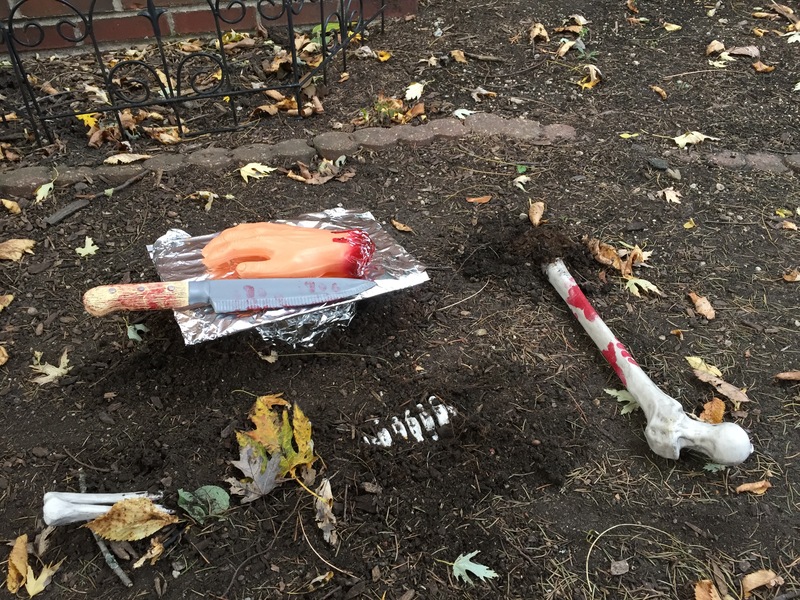 We did a good job, and will hopefully scare the neighborhood children come Monday’s Halloween trick-or-treatathon. 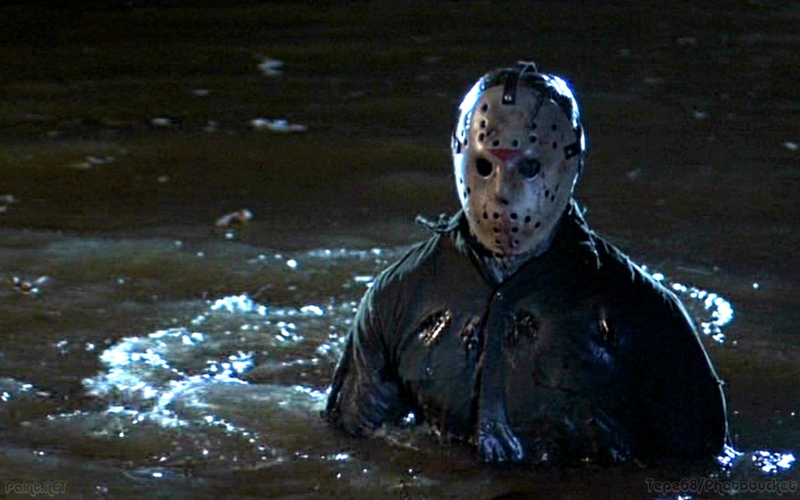 But our house wasn’t the only scary thing in Crystal Lake. 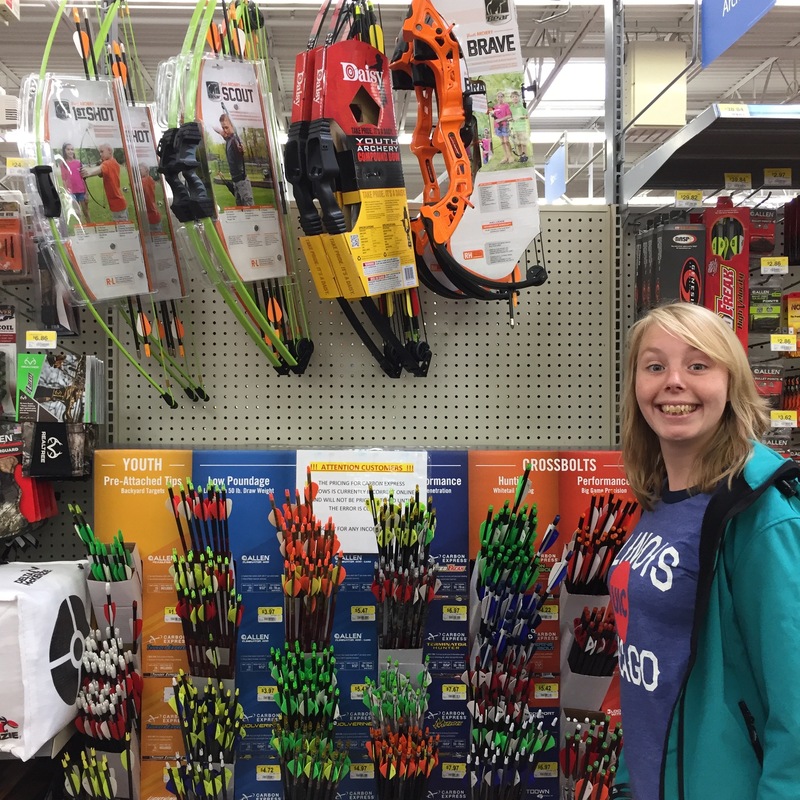 There was also…WALMART. 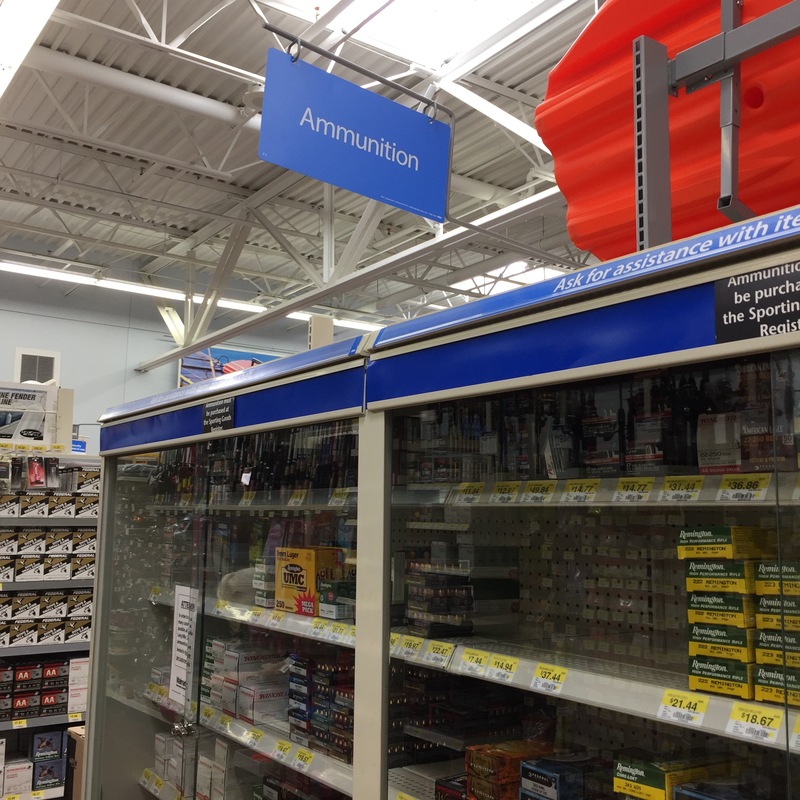 Because although you can’t get bullets at my local Jewel — and thank goodness for that — you can certainly get them at the local Walmart, where along with your baby formula, vitamins, green peppers for that chili you’re making, and new hand towels for the guest bathroom, you can buy as much ammo as you need! Great! Bullets, bullets, so many bullets! Welcome to the U.S.A.! 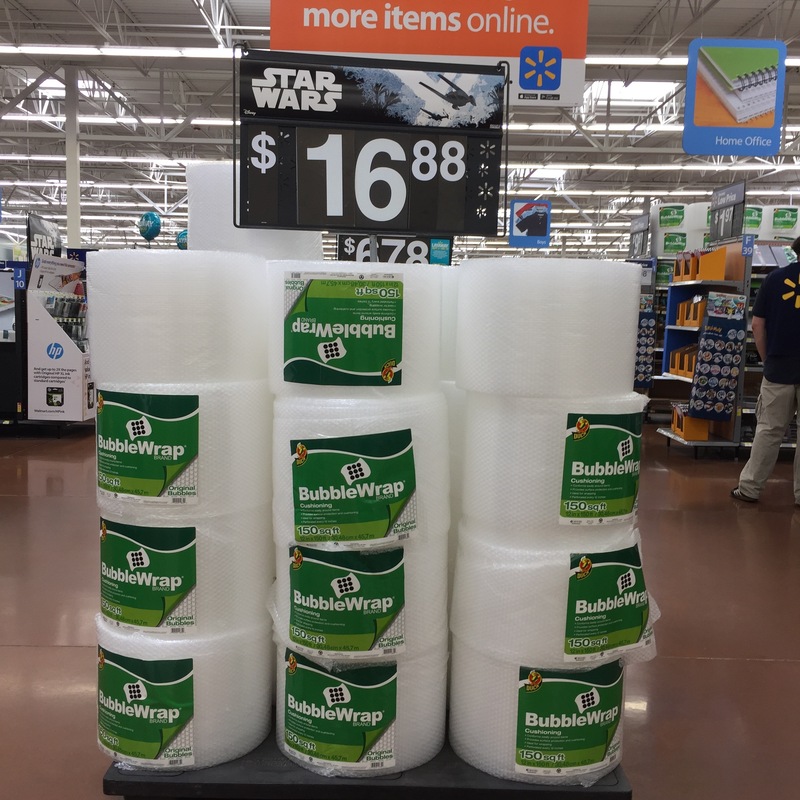 Because who doesn’t need this much bubble wrap? And it’s somehow used by the Rebel Alliance, so…there’s that. 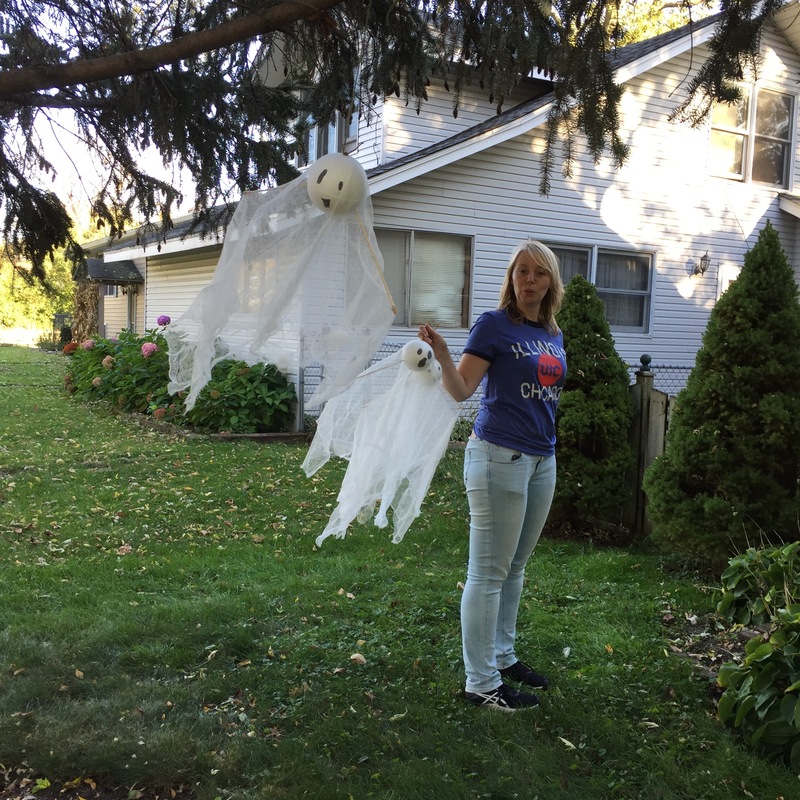 For more about Noëmi’s adventures with Halloween and Walmart, check out her excellent blog (it’s in Dutch, but her pictures are terrific [and maybe you read Dutch! I don’t know your life!]). I’ll have more posts about Noëmi’s last days of adventuring at Camp Crystal Lake and Chicago, so come back soon! 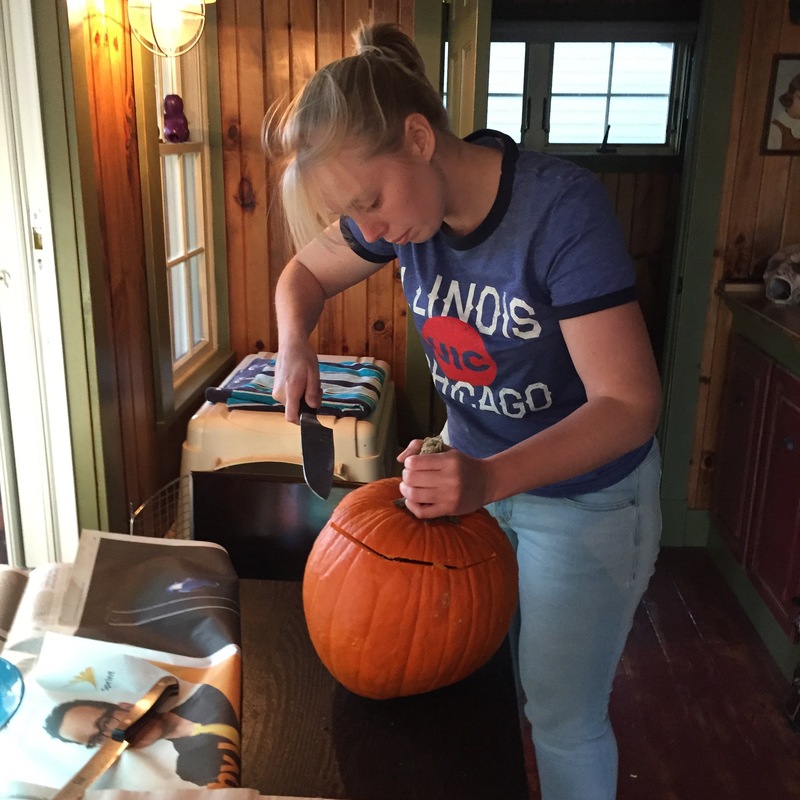 This entry was posted in Lake Life, School, Work and tagged Ammunition, Bullets, Camp Crystal Lake, Dutch, Halloween, Halloween Decorations, Jack-o-Lanterns, Netherlands, Pumpkin Carving, Pumpkins, Sabbatical, Walmart on October 27, 2016 by lauraborkpower. 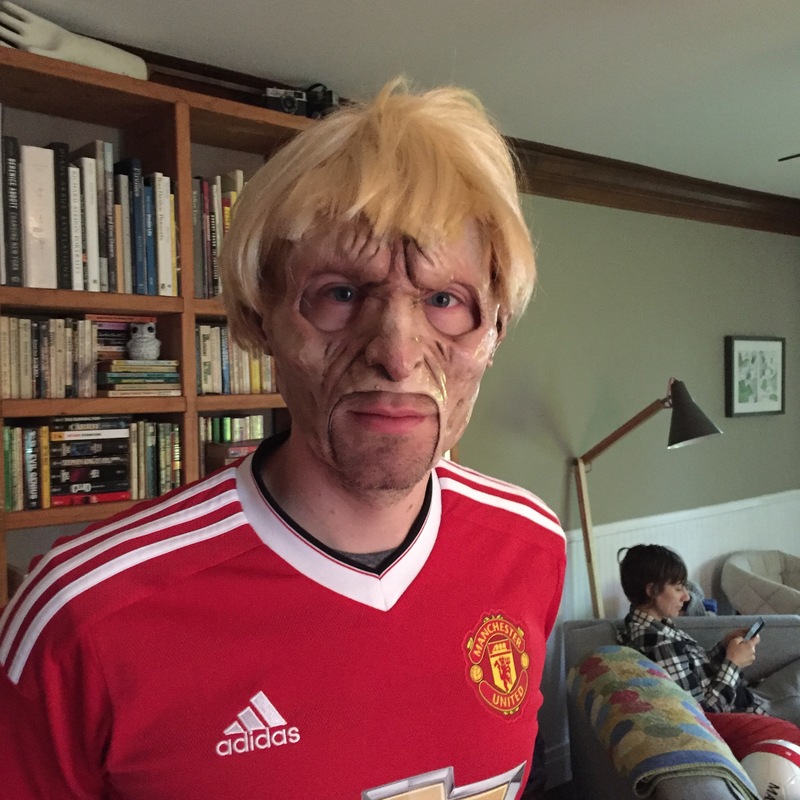 Happy Halloween, you spectacular humans! We’re celebrating this Halloween weekend with our friends Cristen and Jayson (who arrived at Camp Crystal Lake last night) and Juli and Matt (who are scheduled to arrive this evening). 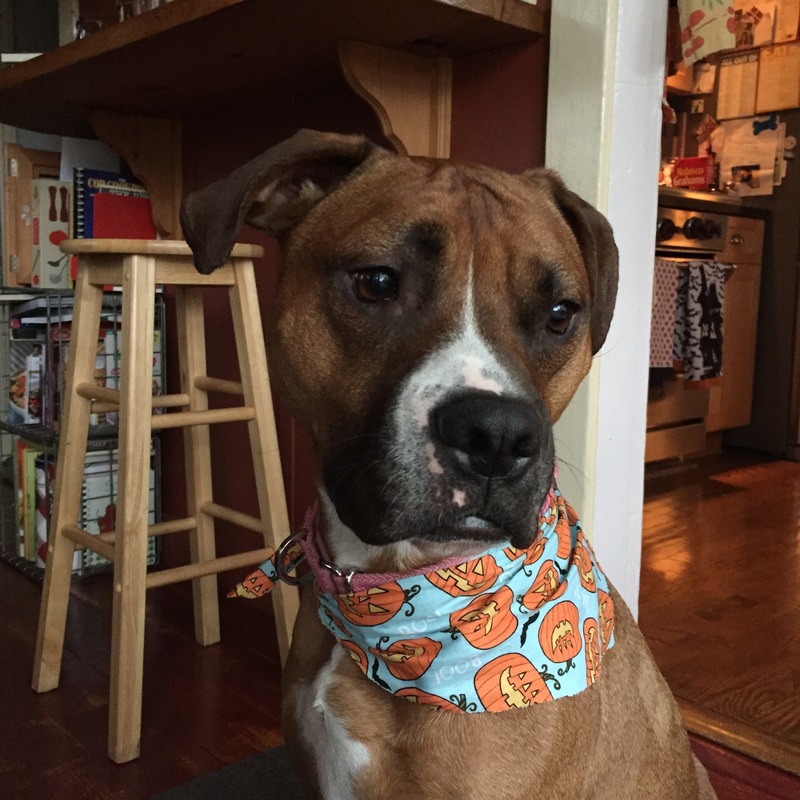 It’s a rainy day, so we likely won’t be doing much decorating this morning, but we’re definitely gearing up for any trick-or-treaters who brave the weather and come by the house today. Holy crap. Cristen doesn’t realize what’s lurking behind her. 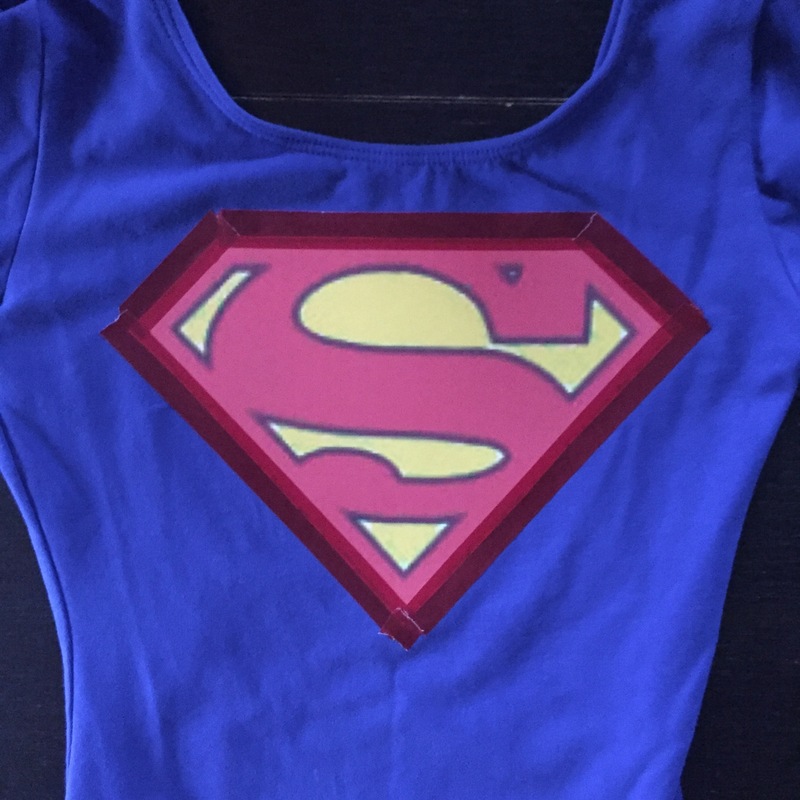 And I had time this week to get ready and try out some costumes. There was a costume contest at school on Wednesday, so I took the opportunity to dress up a little bit, knowing that I would blend in with some of the students. It just so happened that I had some elements of a witch costume in my closet, so I donned my hat and striped stockings, painted a spider on my face, and went to class. Luckily, the students were doing a group activity and didn’t have to listen to me talk; otherwise, they’d not have heard a word I said. 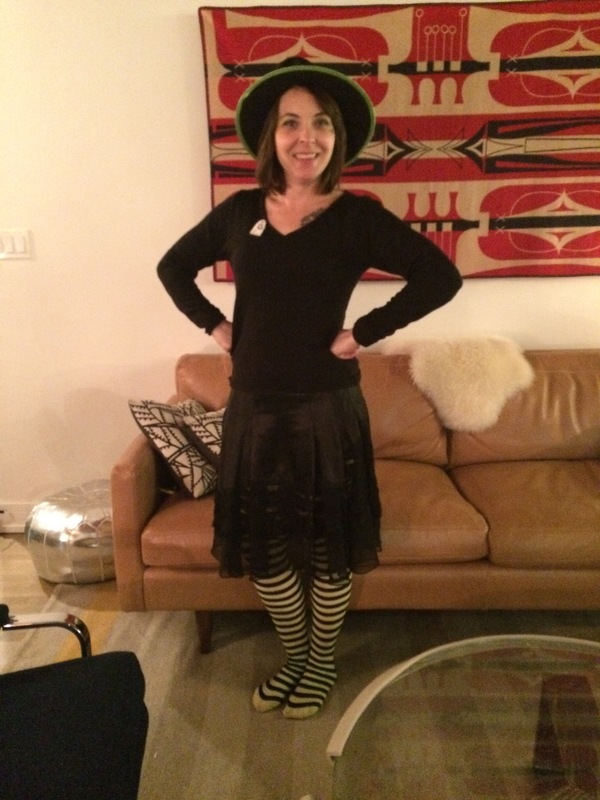 And I got to wear my “costume” to book club that evening, so it was a double bonus! Thanks, Cecile, for the picture! 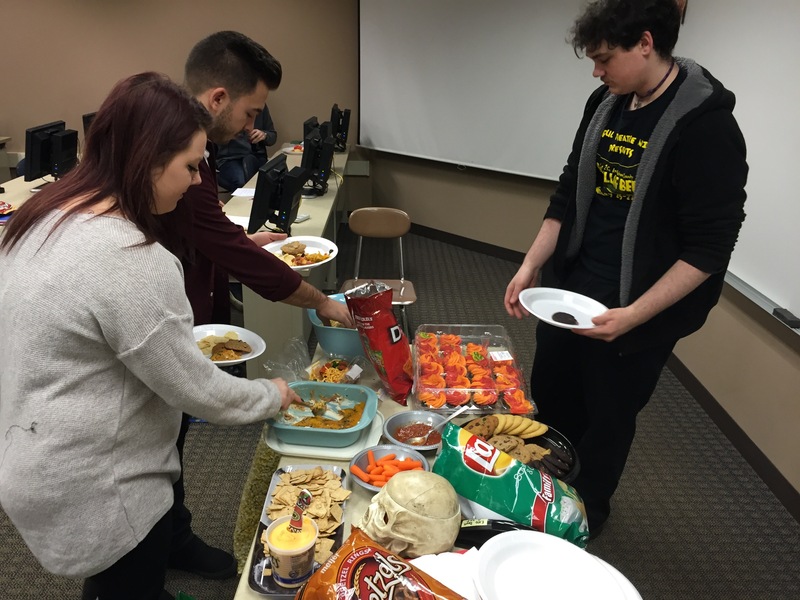 On Thursday, our English comp./horror film class had a Halloween pot-luck, so my co-teacher and I took the opportunity to dress up. 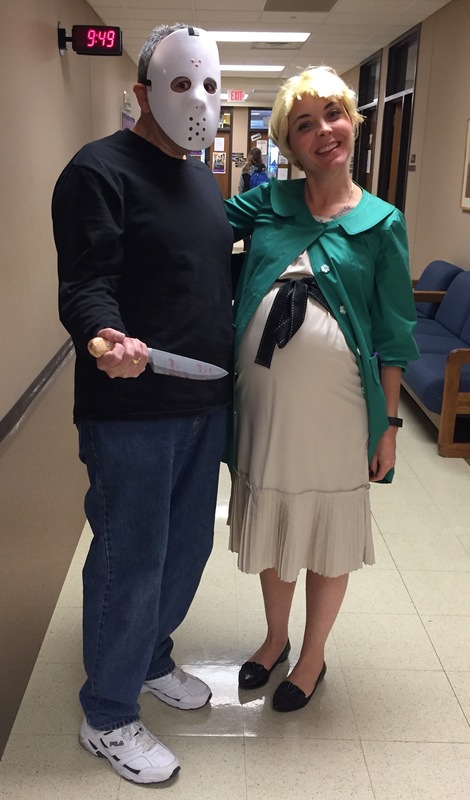 He pulled off a good Jason Voorhees, and I tried my best to be Rosemary Woodhouse. The students didn’t dress up much (although we had a cowgirl and a male version of Mia Wallace’s o.d. 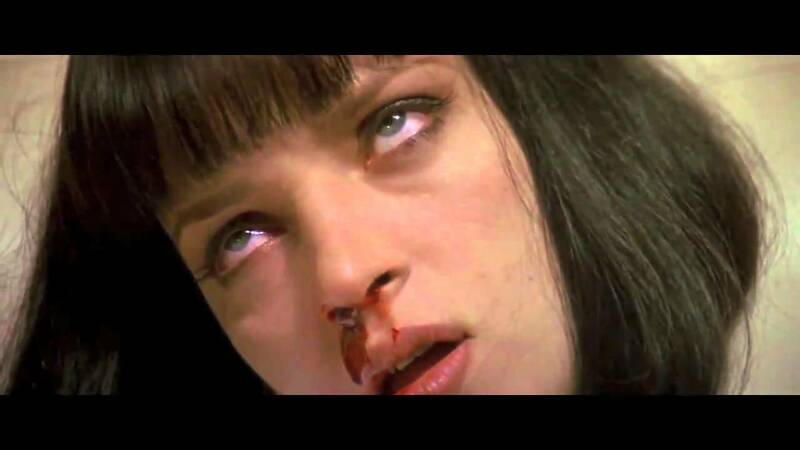 in Pulp Fiction), but they really pulled through on bringing excellent snacks for our viewing of Scream. 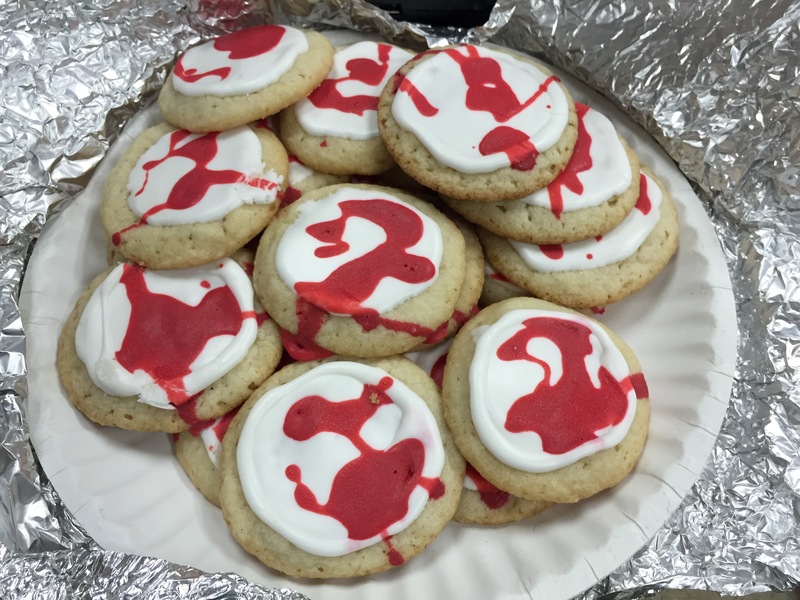 One of our students brought blood spatter cookies. BLOOD SPATTER COOKIES!!! There will be more pictures to come, so check back later this weekend. And everyone have a happy Halloweeeeeeeeeen! 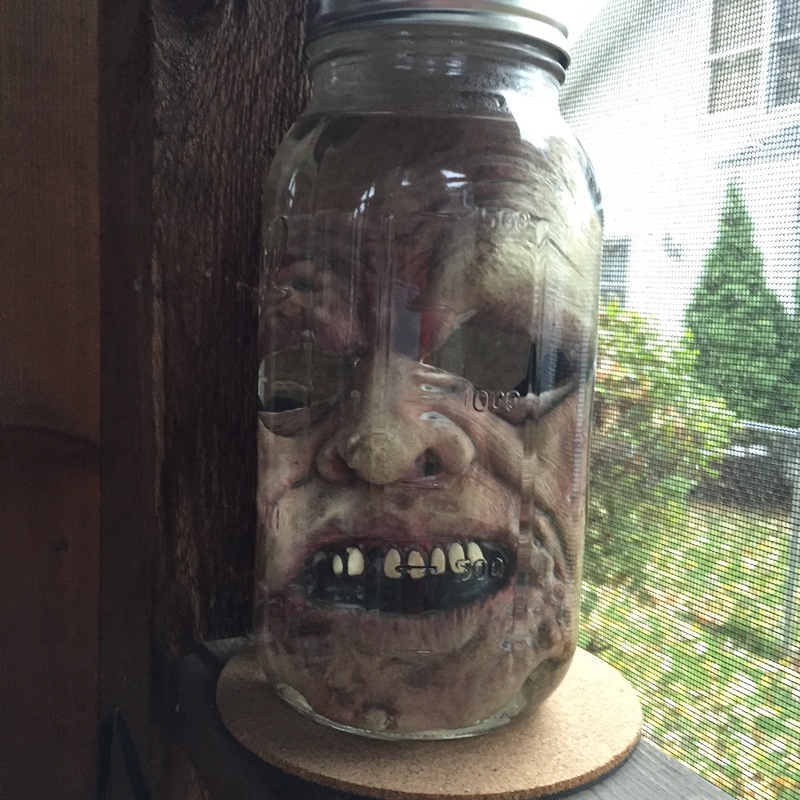 This entry was posted in Friends, Lake Life and tagged Camp Crystal Lake, Costumes, Halloween on October 31, 2015 by lauraborkpower. Last week, the website Cinefilles (Real Girls. 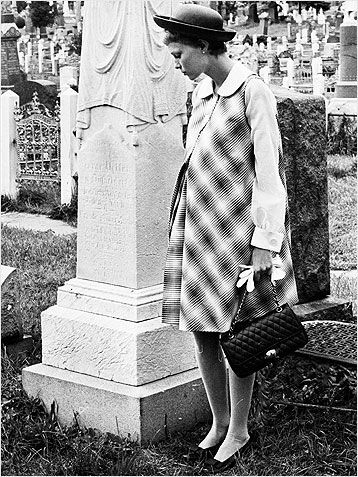 Reel Reviews) published an essay I wrote for their Galloween series, celebrating women in horror. I hope you enjoy it! This entry was posted in Writing, Writing About T.V. and tagged Carrie, Cinefilles, Galloween, Halloween, Horror, Housebound, The Babadook, The Exorcist, The Stepford Wives, You're Next on October 16, 2015 by lauraborkpower. 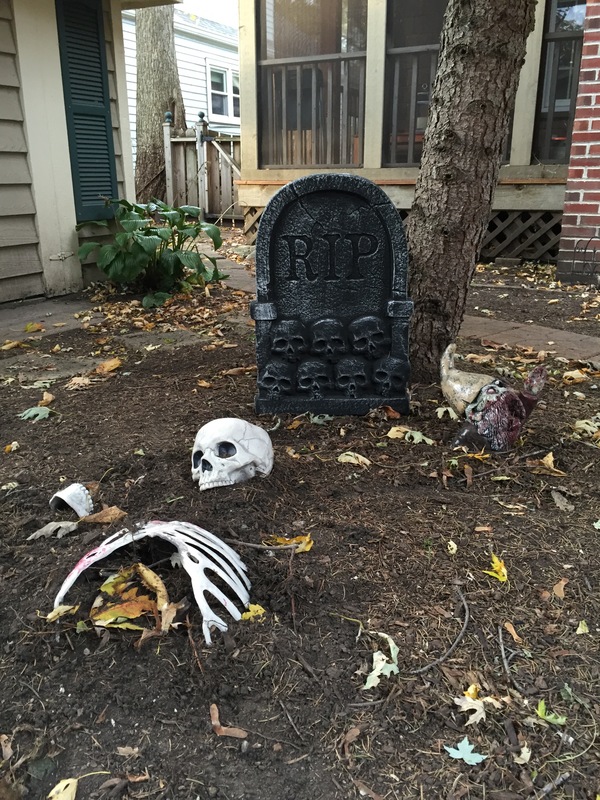 A small grave that someone has been digging up. Probably the rabbits; they’re always up to no good. 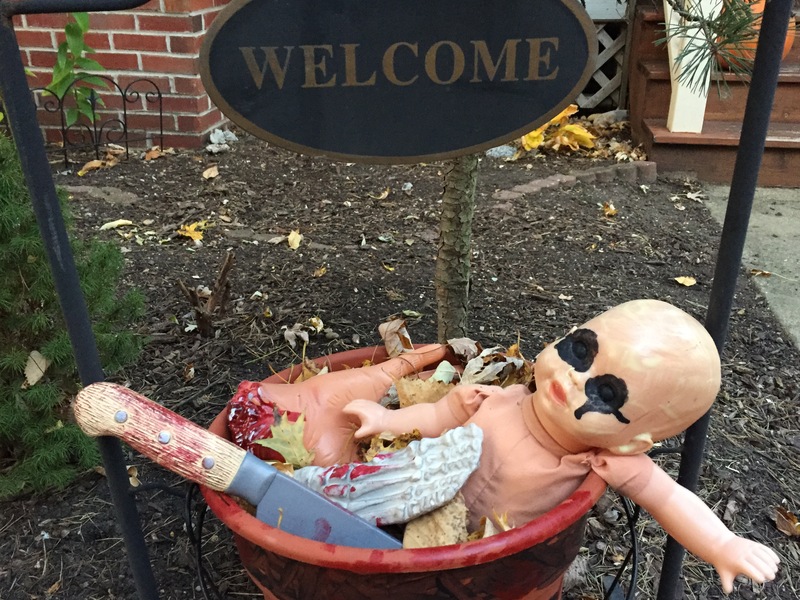 This baby might be too creepy for the little kids, so I might wait until dark to put it out. But then again, maybe not. 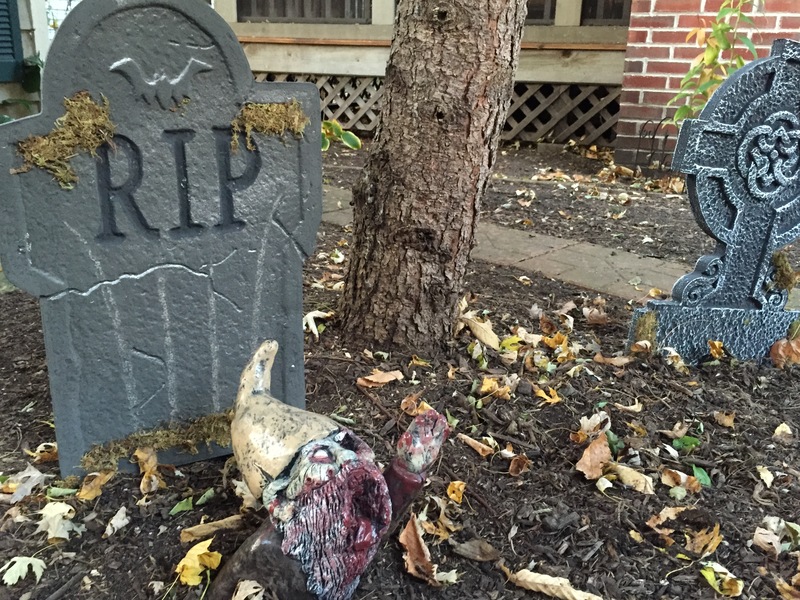 A zombie gnome rises from the grave. 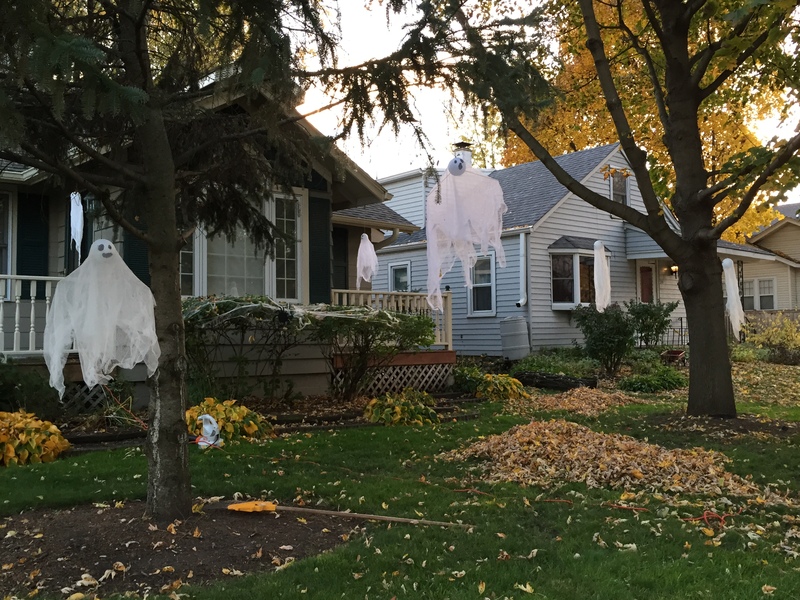 Some ghosts, hanging around in the front yard. 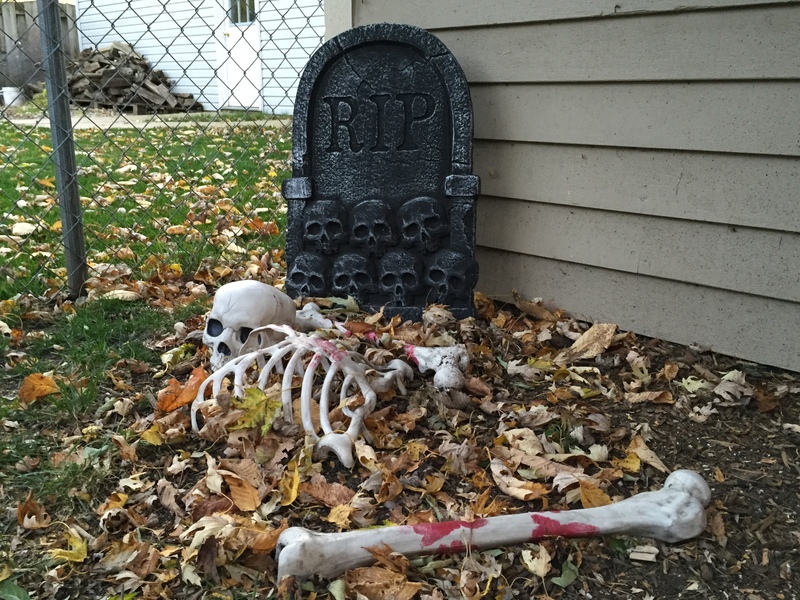 Check back later for even more spooky scenes. 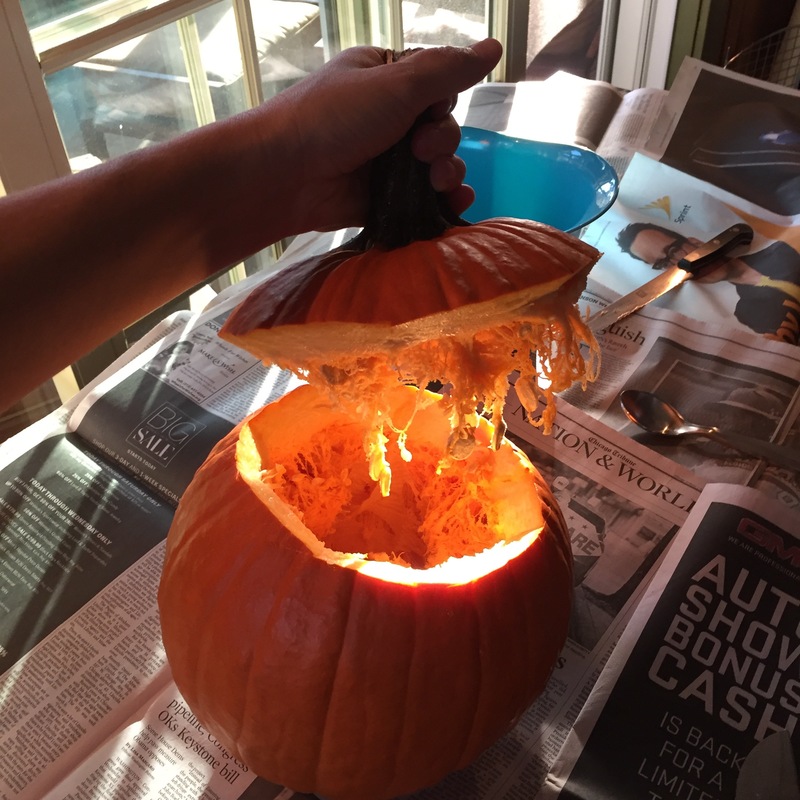 How are your decorations coming along? 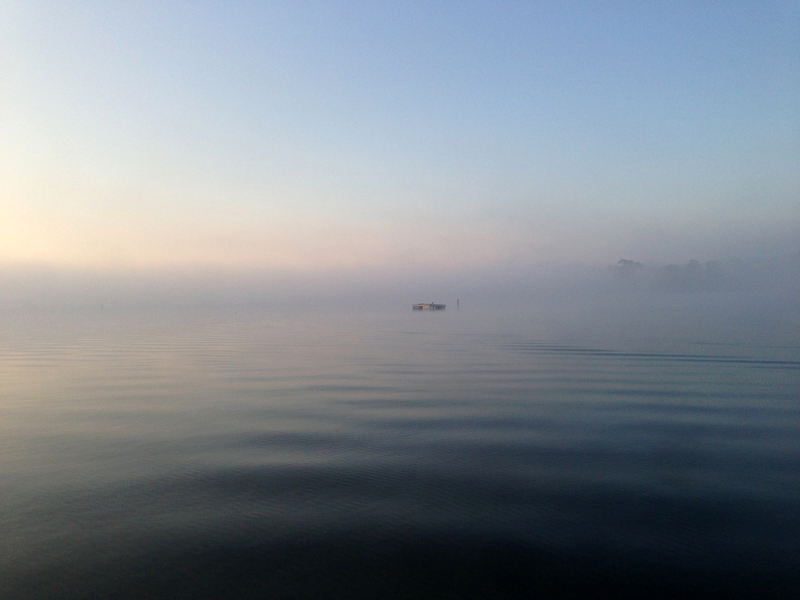 This entry was posted in Lake Life and tagged Camp Crystal Lake, Halloween on October 30, 2014 by lauraborkpower.